Many years ago, Cincinnati was a hotbed for large machine tool companies. That's no longer the case as consolidation and increased competition have forced many companies out of the market. But 117 years after its founding, Cincinnati Incorporated continues to operate its plant and technical center just outside the Queen City. 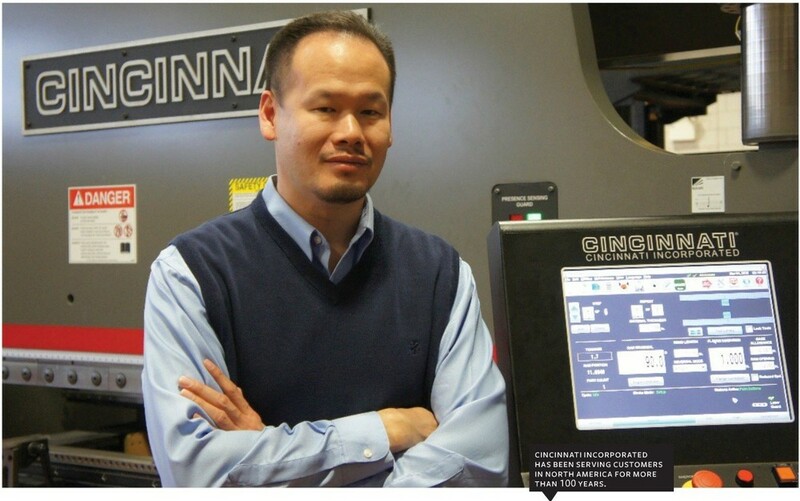 "The company has been remarkably resilient and able to weather many severe economic downturns over the years," says Carey Chen, president and CEO of Cincinnati Incorporated,a leader in manufacturing large industrial machine tools, laser cutting systems, big area additive manufacturing machines and automated solutions. Carey Chen, CEO and President: "We are reinvigorating the company's never-ending journey." Contributing to that resiliency is Cincinnati Incorporated's ability to supply customers in myriad industries, including agriculture, construction, emergency, energy, food and beverage, freight and furniture. Chen notes the company also serves the material-handling, metal service center, military, power distribution, transportation,ship building and telecommunications sectors. Quality is another reason the company has endured for more than a century. "Cincinnati Incorporated machines are engineered and built to the standard of ruggedness required in the North American market," Chen says, "with premium engineering features that stand up to years of rigorous use in demanding environments." The company has an installed base of about 60,000 machines. "Our customer base is extremely diverse, ranging from small fabrication shops up to Fortune 500 manufacturing companies such as Caterpillar, General Electric, John Deere, Steelcase and Disney," Carey says. Cincinnati Incorporated continually seeks ways to achieve operational excellence. "There is significant opportunity to drive waste out of the production process," Chen says. ''Waste can be in many forms, including non-value added waiting and excess inventory." Another initiative designed to reduce waste and save time involves the aggressive management of inventory. "The company attempts to minimize inventory wherever possible," Chen explains. "However, since we are in a cyclical durable goods industry, we occasionally manufacture stock machines to level-load our production. This helps mitigate the whipsaw effect on our production employees and our key suppliers." Cincinnati Incorporated's long-term success has led it to set the bar even higher. "We are diversifying into new products such as big area additive manufacturing [BAAM] with new opportunities and markets," he says. As it explores new initiatives, the company is retooling its manufacturing plant to add capabilities and capacity. "We are reinvigorating the company's never-ending journey of implementing lean practices and operational excellence," Chen says. "Our customers have grown to expect production-proven, reliable machines with integrated controls and software that are designed and built for 24-hour/7-days-a-week operation," Chen says. "They also expect outstanding service, including technical support, to ensure their machines meet their demand for continuous production." The company guarantees quality throughout the manufacturing process. "At the completion of final assembly, a thorough run-in test is performed to ensure that the products will perform to customers' expectations,"he says. "In certain instances, our customers also visit our plant in person to sign off on the product prior to final delivery." Chen notes that the products' basic designs and functionalities do not change frequently. "However, we do offer our customers the ability to customize various options so that they tightly align with their specific manufacturing needs," he says. "Manufacturing has been designed as large job shops, versus batch production, so they are accustomed to the variability. If we are out of internal capacity- human resources or machine capacity some operations may be outsourced to qualified vendors to ensure our target final assembly date." Cincinnati Incorporated maintains long-time relationships with its suppliers by partnering with ones that can flex and adapt deliveries to meet the company's specific needs. "For example, we used to purchase fixed quantities of steel with a defined delivery regardless of the underlying customer demand," Chen says. "Today, we have the ability to buy just what we need, when we need it. We share our internal business forecasts with key suppliers on a regular basis, which allows them to set appropriate inventory levels to accommodate our demand requirements." Cincinnati Incorporated has overcome numerous challenges throughout the years, especially those that involve meeting customer needs, Chen notes. ''Within the last year, we sold a laser system in Russia," Chen recalls. "To meet the local needs of our customer, we needed to change the operating voltages on the chiller and dust collector during the installation. Rather than trying to coordinate parts deliveries and schedule our internal service in the United States to make the required modifications, two of our suppliers agreed to make the changes in country."